Lindsay Hochman, DVM, MPH, is a clinical lecturer of integrative medicine at University of Florida College of Veterinary Medicine, where she also earned her DVM and MPH and completed an internship in integrative medicine. She is currently completing residency requirements for board certification from the American College of Veterinary Sports Medicine and Rehabilitation. Justin Shmalberg, DVM, DACVN, DACVSMR, is a clinical associate professor and service chief of integrative medicine at University of Florida College of Veterinary Medicine. He earned his DVM from University of Wisconsin–Madison and completed an internship in veterinary acupuncture and a residency in small animal clinical nutrition at University of Florida. 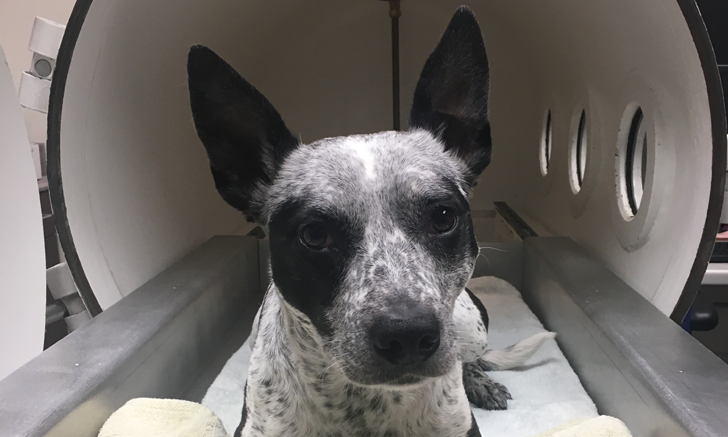 Hyperbaric oxygen therapy (HBOT) is a comparatively novel treatment in veterinary medicine and one that has generated both interest and controversy. HBOT is equivalent to drug administration, albeit in the form of pure oxygen. Although there are associated adverse events and risks, there is also potential for clinical utility. Rapidly increasing use of HBOT in general and specialty veterinary practices world-wide warrants critical appraisal of the history of the modality; its therapeutic principles, safety, and efficacy; and its application in treating specific diseases. HBOT is most notably related to diving medicine and decompression sickness in humans.1 No published history of veterinary HBOT is available; however, based on the available human data, several specialty practices began employing the modality 2 decades ago using hyperbaric chambers intended for use in humans. The recent appearance of veterinary-specific chambers and more publicized cases has prompted increased use,2 with dozens of chambers now positioned in veterinary facilities across the United States, including University of Florida and University of Tennessee. In addition, CE topics on HBOT use have been featured at major veterinary conferences. HBOT increases the dissolved plasma oxygen content according to 3 main laws that describe the behavior of gases when exposed to alterations in pressure: Henry’s, Fick’s, and Boyle’s.3 Understanding these principles is crucial to comprehending not only HBOT’s mechanism of action but also its potential indications and contraindications. Henry’s Law: The solubility of a gas is proportional to its pressure when in equilibrium with a liquid (ie, solubility coefficient). Fick’s Law: The diffusion of a gas is proportional to the gas concentration gradient or difference in partial pressures of a gas across the tissue. With increasing pressure, the volume of a gas decreases proportionally. In relation to HBOT, Henry’s Law establishes that the higher the treatment pressure, the greater the amount of dissolved oxygen in the blood. Fick’s Law explains the therapeutic potential of HBOT in chronic, nonhealing, and hypoxic wounds, as oxygen diffuses farther into tissues after leaving the capillaries and entering the interstitial fluid—fluid that would otherwise be oxygen deprived secondary to vascular compromise or local inflammation. Boyle’s Law establishes that gas increases in volume in a fixed cavity if not allowed to exit and does so proportionally to the decrease in pressure, thus risking barotrauma in patients receiving a decompression protocol too rapidly. Anecdotal veterinary treatment applications in various species have involved crotalid envenomations, refractory osteomyelitis, reperfusion injury, myocardial ischemia, pancreatitis, and anaerobic infections.8,21,22 Results from a retrospective study of HBOT suggest that the following conditions were frequently treated: compressive and vascular myelopathies, crotalid envenomation, surgical or traumatic wounds, and atypical infections.23 The reliance of HBOT practitioners on low-grade evidence has likely prompted some to withhold advocacy for the treatment until additional information is made available by proponents. A hyperbaric chamber requires substantial and reliable grounding to prevent static or other sparks that can pose a fire risk. An appropriate chamber must be purchased or leased, and oxygen must be delivered to a fixed chamber location. Patients should be supervised during the entire process, and prohibited materials (eg, synthetic bandages or fabrics, electronics, petroleum-based drugs or ointments) should be avoided, as they can be flammable or pose a static electricity spark risk. Total treatment times vary among practitioners, but a standard time of approximately 1.25 hours (inclusive of a gradual pressurization and depressurization period) has been documented.23 IV access and therapy may be difficult unless the chamber is equipped with a special ingress port. Use of sedatives with vasoconstrictive properties (eg, α2-agonists) should be avoided until additional information is available. Although many patients appear to relax during the session, chamber noise and confinement may be a source of anxiety for others. Treatments are often repeated and may be performed once or twice daily over several consecutive days, depending on the condition being treated and apparent patient response. Oxygen toxicity is the foremost concern with HBOT, with a grand mal seizure being the primary sign in animals.23 However, the incidence is likely low based on limited data at 2 ATA for 45 minutes,23 and the risk is dose dependent.24,25 Intrasession seizures are managed with gradual decompression and monitoring. There are no reports of any epileptic predisposition following HBOT-induced seizures. Recent HBOT-related deaths of a patient while in a small animal chamber and of both an attendant and a patient in an equine chamber explosion highlight the need for appropriate safety precautions.27,28 Training courses are provided by veterinary-specific chamber manufacturers and third-party hyperbaric technologist programs. Owners should be informed of the risks for oxygen toxicity and for barotrauma before each HBOT session. Despite a recent increase in interest and prevalence of veterinary HBOT, it remains a less accessible modality, with only a few options (if any) available in each state. Resources such as the Veterinary Hyperbaric Medicine Society (vhbot.org) and Hyperbaric Veterinary Medicine (hvmed.com) provide location maps of US veterinary clinics that have a chamber. Although cost varies by institution, the average cost of HBOT (based on treatment time and ongoing plan) is approximately between $100 and $200 per session. Because of the potential financial and geographic limitations, it is important to discuss the entire hyperbaric treatment plan with the client and set reasonable goals before initiating therapy or suggesting referral. Because of its physiologic effects in other species, HBOT holds therapeutic promise in animals and deserves clinical and research attention. However, the therapy is not benign, and understanding the basics of HBOT and possible complications is critical. Because the clinical information, apart from expert opinion and research experiments with small numbers, remains minimal, research is essential to expand information about the physiology behind the modality, condition-specific treatment parameters, and appropriate and efficacious indications for use in veterinary patients. Jain KK. The history of hyperbaric medicine. In: Jain KK, ed. Textbook of Hyperbaric Medicine. 4th ed. Cambridge, MA: Hogrefe and Huber Publishers; 2004:3-8. Veterinary Hyperbaric Medicine Society. Animal hyperbaric therapy. Knoxville, TN: Veterinary Hyperbaric Medicine Society; 2016. Edwards ML. Hyperbaric oxygen therapy. Part 1: history and principles. J Vet Emerg Crit Care (San Anotnio). 2010;20(3):284-288. Daruwalla J, Christophi C. Hyperbaric oxygen therapy for malignancy: a review. World J Surg. 2006;30(12):2112-2131. Barata P, Cervaens M, Resende R, Camacho O, Marques F. Hyperbaric oxygen effects on sports injuries. Ther Adv Musculoskelet Dis. 2011;3(2):111-121. Knowles JR. Enzyme-catalyzed phosphoryl transfer reactions. Annu Rev Biochem. 1980;49:877-919. Al-Waili NS, Butler GJ. Effects of hyperbaric oxygen on inflammatory response to wound and trauma: possible mechanism of action. ScientificWorldJournal. 2006;6:425-441. Edwards ML. Hyperbaric oxygen therapy. Part 2: application in disease. J Vet Emerg Crit Care (San Antonio). 2010;20(3):289-297. Thom SR. Hyperbaric oxygen–its mechanisms and efficacy. Plast Reconstr Surg. 2011;127(Suppl 1):131S-141S. Bitterman H. Bench-to-bedside review: oxygen as a drug. Crit Care. 2009;13(1):205. Weaver LK, Hopkins RO, Chan KJ, et al. Hyperbaric oxygen for acute carbon monoxide poisoning. N Engl J Med. 2002;347:1057-1067. Benson J, Adkinson C, Collier R. Hyperbaric oxygen therapy of iatrogenic cerebral arterial gas embolism. Undersea Hyperb Med. 2003;30(2):117-126. Moon RE, de Lisle Dear G, Stolp BW. Treatment of decompression illness and iatrogenic gas embolism. Respir Care Clin N Am. 1999;5(1):93-135. Sasaki T. On half-clearance time of carbon monoxide hemoglobin in blood during hyperbaric oxygen therapy (OHP). Bull Tokyo Dent Univ. 1975;22(1):63-77. Kerwin SC, Lewis DD, Elkins AD, et al. Effect of hyperbaric oxygen treatment on incorporation of an autogenous cancellous bone graft in a nonunion diaphyseal ulnar defect in cats. Am J Vet Res. 2010;61(6):691-698. Kerwin SC, Hosgood G, Strain GM, Vice CC, White CE, Hill RK. The effect of hyperbaric oxygen treatment on a compromised axial pattern flap in the cat. Vet Surg. 1993;22(1):31-36. Rosenthal RE, Silbergleit R, Hof PR, Haywood Y, Fiskum G. Hyperbaric oxygen reduces neuronal death and improves neurological outcome after canine cardiac arrest. Stroke. 2003;34(5):1311-1316. Takahashi M, Iwatsuki N, Ono K, Tajima T, Akama M, Koga Y. Hyperbaric oxygen therapy accelerates neurologic recovery after 15-minute complete global cerebral ischemia in dogs. Crit Care Med. 1992;20(11):1588-1593. Kelly DL, Lassiter KR, Vongsvivut A, Smith JM. Effects of hyperbaric oxygenation and tissue oxygen studies in experimental paraplegia. J Neurosurg. 1972;36(4):425-429. Maeda N. Experimental studies on the effect of decompression procedures and hyperbaric oxygenation for the treatment of spinal cord injury. J Natl Med Assoc. 1965;16:429-447. Elkins AD. Hyperbaric oxygen therapy: potential veterinary applications. Comp Cont Educ Pract. 1997;19(5):607-612. Geiser DR. Hyperbaric oxygen therapy in equine rehabilitation: putting the pressure on disease. Vet Clin North Am Equine Pract. 2016;32(1):149-157. Shmalberg J, Davies W, Lopez S, Shmalberg D, Zilberschtein J. Rectal temperature changes and oxygen toxicity in dogs treated in a monoplace chamber. Undersea Hyperb Med. 2015;42(1):95-102. Clark JM, Whelan HT. Oxygen toxicity. In: Kindwall EP, Whelan HT, eds. Hyperbaric Medicine Practice. 2nd ed. Flagstaff, AZ: Best Publishing Company; 1999:69-82. Hampson N, Atik D. Central nervous system oxygen toxicity during routine hyperbaric oxygen therapy. Undersea Hyperb Med. 2003;30(2):147-153. Jain KK. Hyperbaric chambers: equipment, technique, and safety. In: Jain KK, ed. Textbook of Hyperbaric Medicine. 4th ed. Cambridge, MA: Hogrefe Publishing; 2004:59-72. Travis R. Vet blames dog for hyperbaric chamber explosion. Fox 5 Atlanta. March 17, 2016. http://www.fox5atlanta.com/news/i-team/109338585-story. Updated April 12, 2016. Accessed May 3, 2017. Hiers F. Report released on hyperbaric chamber explosion. Ocala Star Banner. February 16, 2012. http://www.ocala.com/news/20120216/report-released-on-hyperbaric-chamber-explosion. Accessed May 3, 2017.